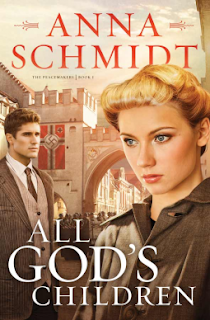 Thanks to NetGalley, I was able to read All God's Children by Anna Schmidt. Does their love stand a chance. . .if they even survive at all? Beth Bridgewater, a German American, finds herself in a nightmare as World War II erupts—a war in which she takes no side, for she is a Quaker pacifist. Just as she gains opportunity to escape Germany, Beth decides to stay to help the helpless. Meanwhile, Josef Buch, a passionately patriot German, is becoming involved in his own secret ways of resisting the Nazis. . . . Despite their differences, Beth and Josef join together in nonviolent resistance—and in love. I very rarely ignore a WWII book that catches my eye – and I'm glad I didn't pass by All God's Children. I enjoy reading of the secrecy and intrigue of that time, and especially of those who put their own lives in danger to help those truly in harm's way. I actually liked the uncertainty of Josef's allegiance through much of the book, being a German soldier and having a high-ranking Gestapo father; it kept suspense in the storyline as I didn't think leaflet printing felt all that dangerous (it was, it just didn't feel as suspenseful as other activities that took place during the war). I held out hope through the whole book that maybe his father was in the resistance, too...? All God's Children kept me turning the pages late into the night and ended satisfactorily, as WWII books often have threads that don't all tie up, due to the nature of the time. But, how glad I was to read the author's note to see that she has a book 2 and 3 planned to continue some of the unfinished characters' stories...and I have every intention of reading them! All God's Children releases in September. You can preorder your copy HERE! Also reviewed on Amazon (will once released) and Christianbook.